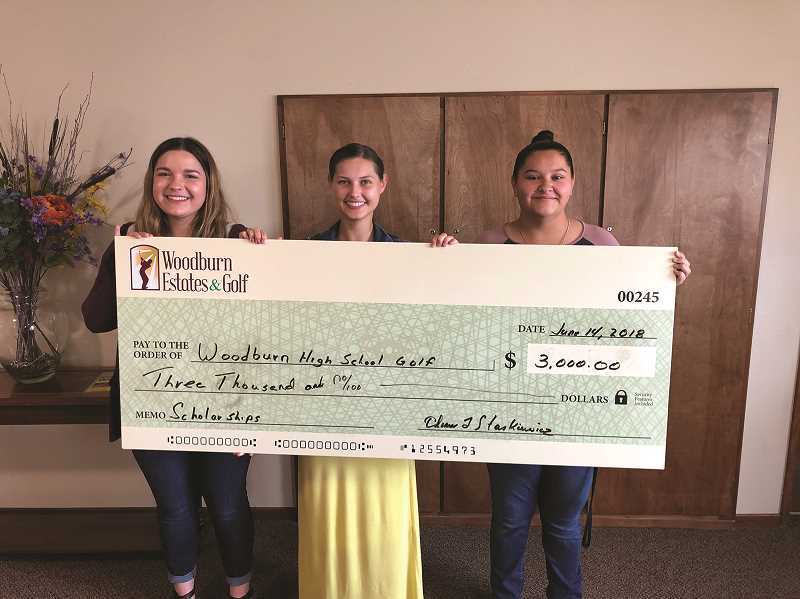 The Woodburn golf program received a donation from the Woodburn Estates & Golf this month to provide college scholarships for three graduated seniors. Brynn Tupper, Efrosenya Toran and Maddie Castro each received $1,000 courtesy of the Estates, which held a charity golf tournament in April in conjunction with the 2018 Wooden Shoe Tulip Festival to help raise the funds. "We're just excited to have the opportunities to help out," Estates General Manager Tom Staskiewicz said. "They're just great young ladies, (and) were grateful and very appreciate of what we were going to do." The scholarship idea came about after Staskiewicz reached out to Paul Iverson of the Wooden Shoe Tulip Farm to propose a golf tournament fundraiser to coincide with the annual Tulip Fest, which provides a number of fundraising opportunities for organizations around the region. After his suggestion of supporting the high school golf program got the green light from Iverson, Staskiewicz set it up with the Woodburn High School athletic director and with Woodburn girls golf coach Neil Wilhelm. The original plan for the tournament, dubbed the Tulip Tee-Off, was to provide two scholarships for a pair of graduating seniors from the Woodburn golf program — one boy and one girl. Staskiewicz didn't set his expectations high for a first-year tournament, and figured it would be a nice gesture to provide some book money for a pair of college-bound golfers. "Initially, I had no idea what was going to happen," Staskiewicz said. "I thought it would be cool if we could do $250 to offer." But as sponsors kept pouring in and people began to register, Staskiewicz realized the Estates would be able to offer up a much bigger scholarship than anticipated. And while there were no graduating seniors among the boys, there were three on the girls side: Tupper, Toran and Castro. In the end, the tournament provided enough funds for the Estates to up its initial offer from two scholarships to three. "It was a really generous gesture from the Estates and Tom," Wilhelm said. "It certainly makes the kids feel good and makes them feel supported." All three seniors are planning to continue their education at Chemeketa Community College. A member of the junior varsity team, Tupper played for the Bulldogs her last three years, splitting time between athletics and academics. "She probably didn't have quite as much as some of the others to dedicate to golf, but she stuck with it," Wilhelm said. "She continued to improve and play for us, come out every year and certainly worked really hard when she was out there." Toran and Castro were varsity golfers on this year's team that went to the 5A State Golf Championship and finished sixth overall — the highest placing in program history. Wilhelm said Castro is interested in pursuing additional education in engineering, while Toran's interests are broad and could land her anywhere from business to law enforcement, depending on which route she follows. "I know they'll do great," Wilhelm said. "They're just really good representatives of our program, very dependable and successful in the classroom and have strong character. It's just fun to see that it's going to continue their education." While the Woodburn golf program calls the OGA course its home, the Estates has welcomed the team to practice on its course, which requires much more precise and technical skill to navigate between the homes. "We used their course and their practice facilities a few times," Wilhelm said. "It's great to have all those different support systems for our kids." The partnership with the golf program was a natural pairing, Staskiewicz said, considering the mutual interests. But beyond that, Staskiewicz said that members of the Estates strive to take an active role in the positive development of youth in Woodburn and the community at large. "We want the community to know that we're supporting," he said. "We don't want to be sitting out here thinking we're a bunch of isolated seniors. Our involvement is important that people know that we appreciate the community that we're a part of." And with the success of the inaugural Tulip Tee-Off, there's no doubt that next year's Tulip Fest will once again feature the tournament at Woodburn Estates & Golf. "We're hoping we can get more teams involved and we exceed what we did this year," Staskiewicz said.